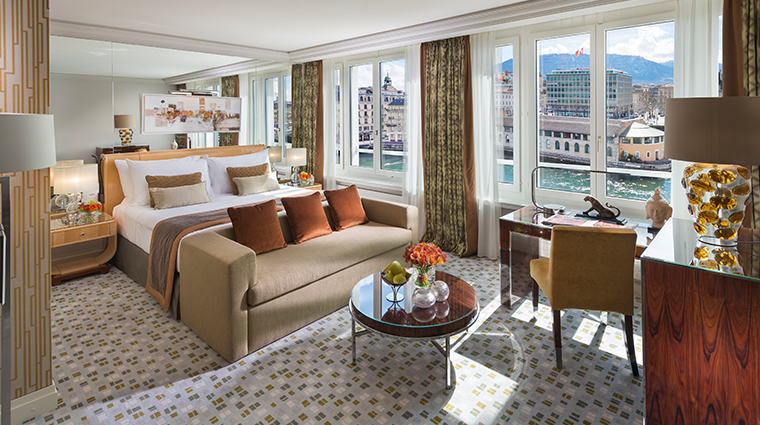 Mandarin Oriental, Geneva is listed as one of the Swiss city’s Historical Heritage landmarks — it was originally the Hotel du Rhône, the first luxury hotel built after World War II. Designer Adam Tihany combined bold Art Deco features with Asian accents to create an elegant and modern feel in the public spaces, which include a sleek marble lobby, a trendy bar and a fine-dining Indian restaurant. 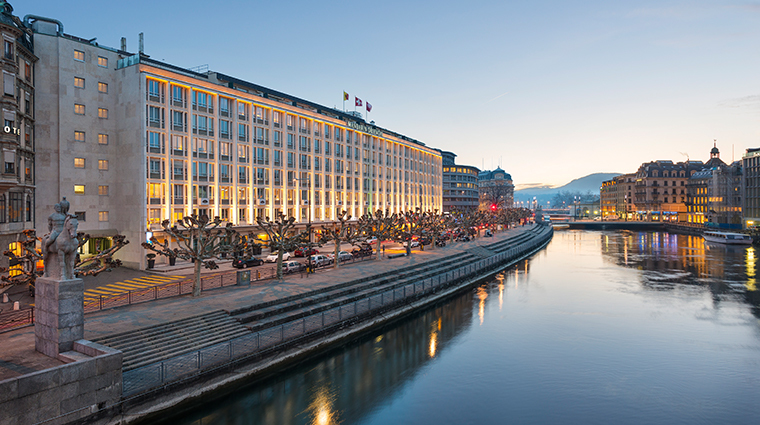 Located on the right bank of Rhône River, it is ideally located within easy reach of Geneva’s shopping, cultural and business districts. A gathering place for locals and visitors alike, MO Bar features an extensive drink menu with innovative cocktails (a Suisse Manhattan is made with Talisker Whisky infused with Grisons dried meat, Antica Formula vermouth and angostura bitters) and signature sips, such as the creme brûlée-inspired Dolce Vita created by MO Bar Hong Kong. 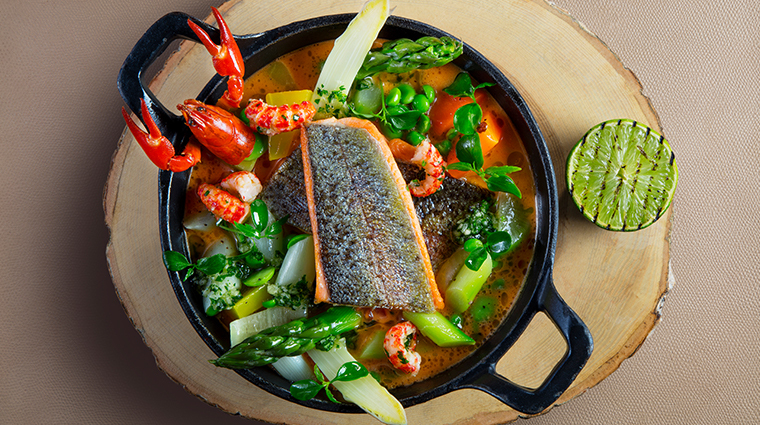 The food is a highlight here, where you can enjoy upscale Indian fare or modern French dishes at the hotel’s signature restaurants. 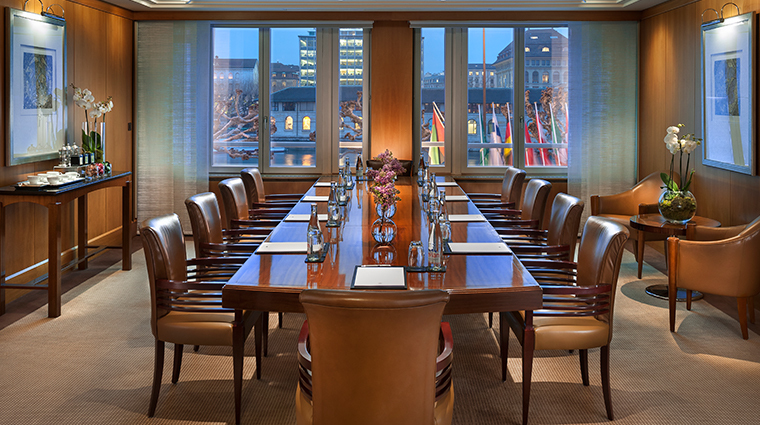 The riverfront Geneva hotel offers an ideally central location, within walking distance of St. Peter’s Cathedral, the United Nations building and a variety of chic boutiques and restaurants. 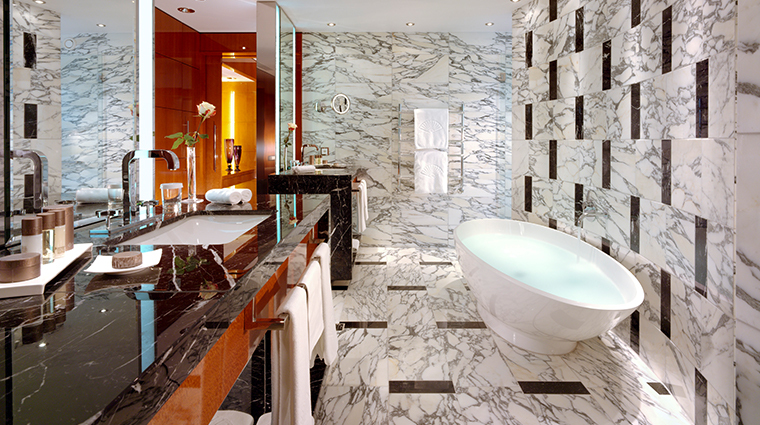 The Mandarin Oriental, Geneva’s 24-hour fitness center also offers a separate hammam and sauna for men and women. Open 24 hours, the fitness center has equipment by Technogym and a weightlifting area. Coiffeur du Rhône is a full-service beauty salon on the first floor of the Geneva hotel; it offers services ranging from hair styling to pedicures. 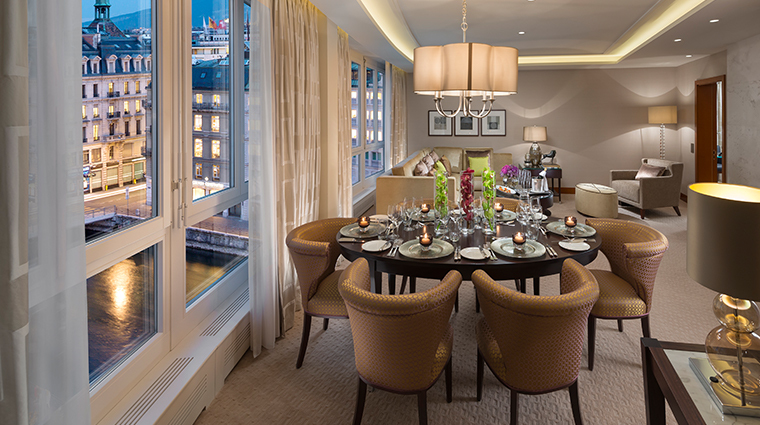 If you’re traveling with the family, opt for a Junior Suite. 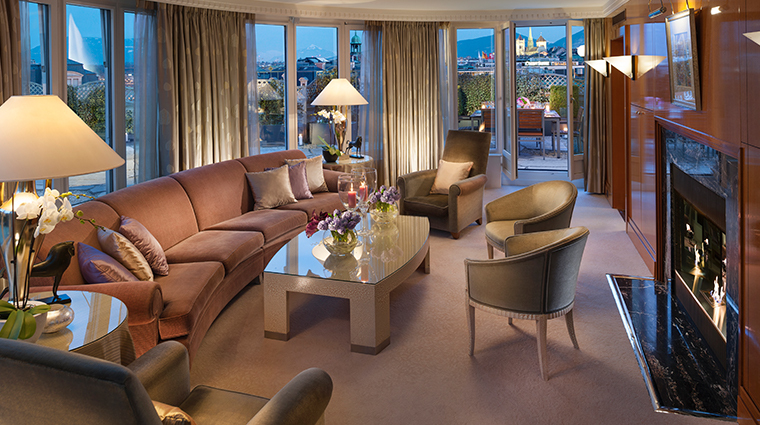 Many of these rooms are interconnected and they offer private terraces overlooking Geneva. The on-site "Suite Beauté" was developed in collaboration with Geneva-based luxury cosmetics company Bellefontaine and offers a selection of carefully curated body and beauty treatments. In the guest rooms, designer Sybille de Margerie used sophisticated earth tones, parquet flooring and wool carpets to create an elegant, clean design. Bold modern art sits alongside Swiss-made furniture and ultra-plush beds; the oversized bathrooms feature Greek marble, rain showers, separate tubs and bidets. 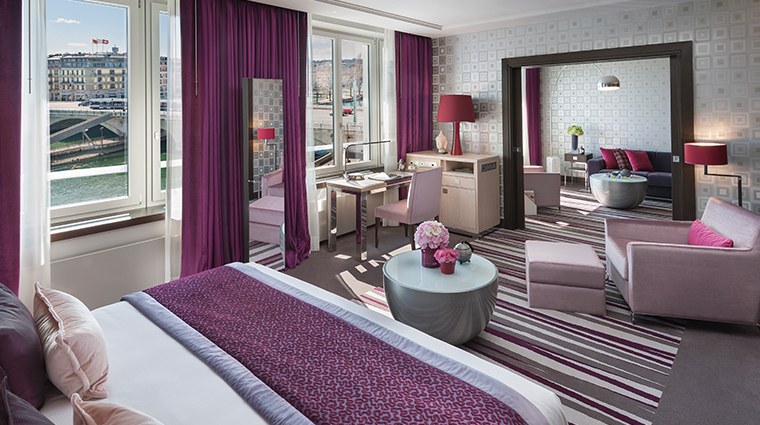 The Mandarin Rooms located on the sixth floor offer views of the Rhône River, mountains and charming Old Town. These large rooms have either a palette of silvers and fuchsias or one of gold tones and come with two bathrooms. 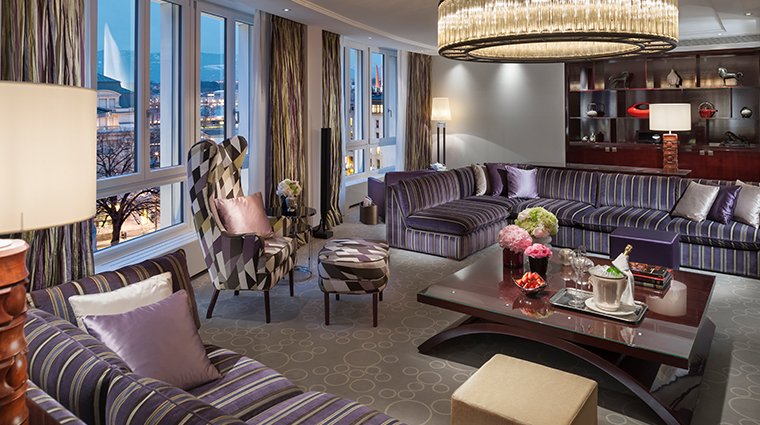 All rooms have flat-screen televisions, audio systems and Nespresso coffee machines. Sliding cabinets accessible by staff from the outside hallway mean mini-bars are refilled without disturbing you. Rasoi by Vineet is the hotel’s acclaimed signature restaurant. It serves upscale Indian fare by chef Vineet Bhatia in a room decorated in rich reds, purples and silver-leaf accents. Open Tuesday through Saturday, Rasoi by Vineet serves lunch and dinner — expect shareable modern dishes inspired by age-old Indian cooking, such as king kachori chaat, blackened sea bass and crawfish moilee, 24-carat black chicken, and tamarind beef and spinach upma. 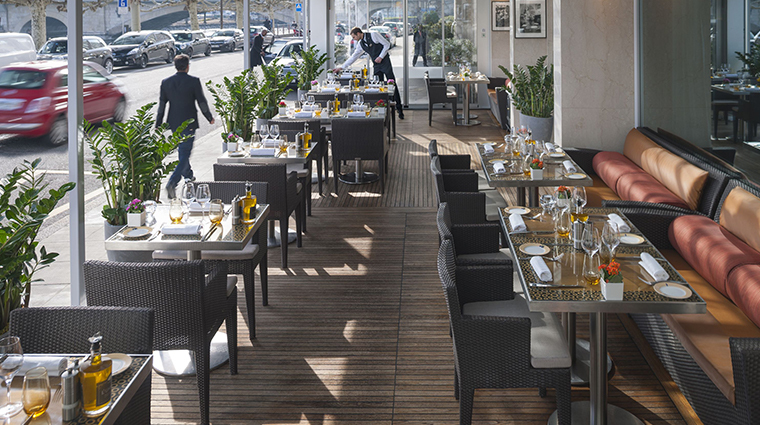 Casual, yet sophisticated, Café Calla is under the direction of chef Nasser Jeffane, a protégé of acclaimed French chef Thierry Marx of Mandarin Oriental, Paris. 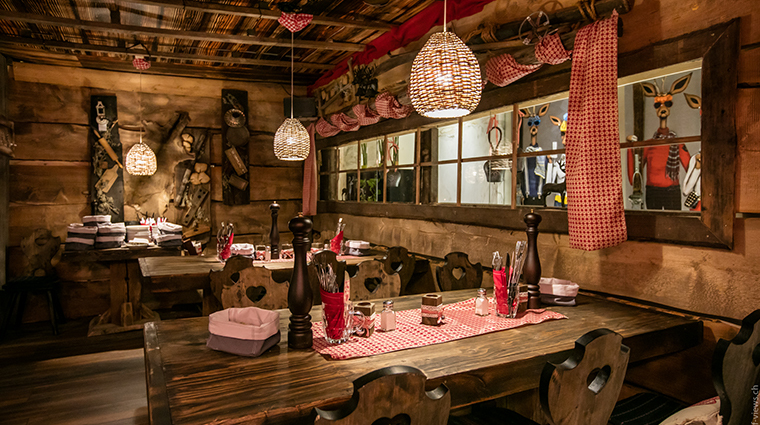 Serving breakfast, lunch and dinner, Café Calla’s chic design features a circular, glass wine cellar filled with more than 1,500 local and international wines.